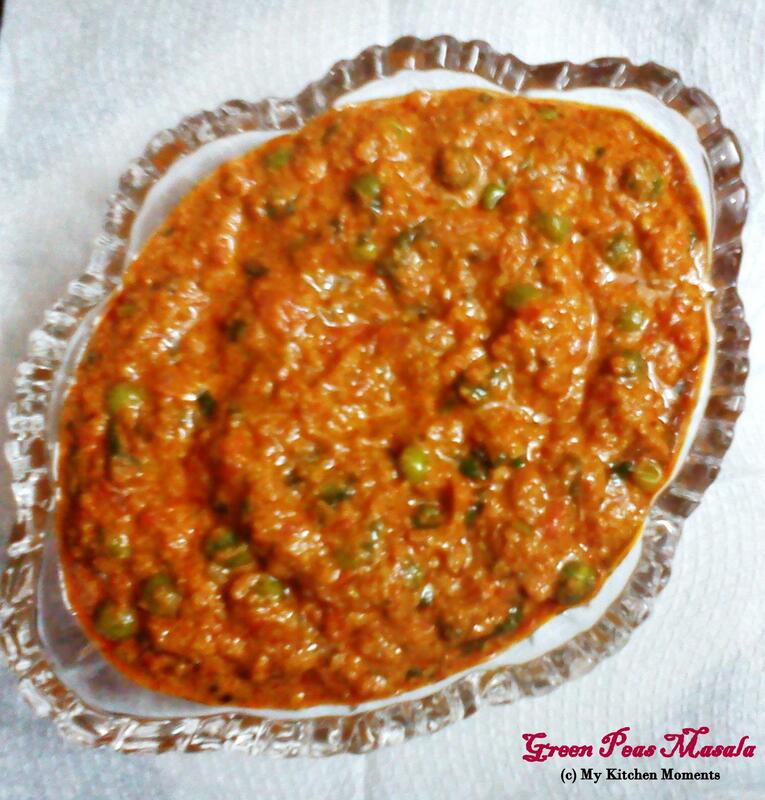 Green peas masala is a delicious North Indian side dish for roti, phulkas, chapathi’s, naan’s or can be had even with plain rice. It is easy to prepare but a rich gravy which instantly fills one’s tummy. I like the smell, taste and the flavor of fresh peas from the pods. Though the green peas are seasonal vegetables available in the freshest form during winters, but one could get it during the off-season times as frozen or dried one’s. I know that nothing can beat the taste of the fresh green peas in a gravy/ sabzi, but once in a while having frozen or dried one’s can definitely satisfy your appetite. So when i saw those lovely dried green peas in the supermarket yesterday when i went for grocery shopping, i could’nt help but buy them. I remember whenever we go out for dinner as a family, my dad loves to order green peas masala as a side dish for roti’s. So i thought why not prepare the same restaurant style green peas masala for dinner along with rotis and make my dad happy. Remove the green peas from the pods (if you are using fresh one’s). Or if you are using dried ones, wash the green peas and soak them in water overnight. And then pressure cook the green peas for up to 4 whistles and set aside. Grind the cashews with curd and keep aside. In a heavy bottomed pan, add a tablespoon of oil and add the ingredients under ‘To saute and grind’ and saute till the tomatoes turn mushy. Keep aside and allow it to cool. Once it cools down completely, grind it into a fine paste. Then in a small pan, add a tablespoon of butter and add the items given under ‘To temper’. Now add the finely chopped onion (from the ingredients list) and sauté till it is slightly browned. Then add the ground mixture and sauté. Once the above items are sauteed well (it may take around 4 to 5 minutes), then add in the garam masala powder, channa masala powder, red chilli powder and required salt. Now add a cup of water (or as desired by you) to bring it into a running consistency. Let it boil for 5 minutes. Now add the cashew paste and give a complete stir. Let it boil for 2 minutes. Then add the pressure cooked peas, a pinch of sugar and cook in a low flame for about 5 to 10 minutes. Then add the fenugreek seeds powder or kasoori methi, chopped coriander leaves, curry leaves and give one complete stir. Remove from flame. Serve with Roti / Chapathi/ Phulka/ Plain rice. Always add channa/ chole masala powder even though you may add garam masala powder for that extra flavour. Using Kashmiri red shilli powder will give you that red color so famous in restaurant style green peas masala. You may adjust the green chilli according to your spicy needs. Insted of curd to grind along with cashew, adding cream or malai is also an another option. Curry sure looks thick n rich!A perfect to go with Chapathis!! Thank you 🙂 I second you!! It is a gravy. Thank you so much! First time here. Nice space dear. Happy to follow you. Do visit my space if you find time. Thank you so much 🙂 Do try it out, you will like it. wow, loooks pretty damn spicy and delicious!!! This looks mouthwatering. I look forward to exploring more of your blog. Emma.